Augusta Daily Gazette [Kansas], “2004-04-18,” Digital Augusta, accessed April 25, 2019, https://augusta.digitalsckls.info/item/1408. Dorothea King, 102, El Dorado, retired elementary teacher, passed away on Sunday, April 18, 2004. Her funeral service will be held at 10 a.m. on Friday, April 23, at Carlson Funeral Home in El Dorado. Burial will be at Sunset Lawn Cemetery in El Dorado. Visitation will be Wednesday and Thursday i at Carlson Funeral Home, with visitation with the family from 6 to 7:30 p.m. Thursday, April 22. Dorothea Narcissa Sharp was born on Nov. 22, 1901 in McPherson, the daughter of W.A. Seward Sharp and Florence Wooley Sharp. Her parents were missionaries in Burma, where she spent the first five years of her life. She graduated from Ottawa University in 1923. She taught school in Copeland where she met her future husband, Lloyd C. King, who was principal at the high school. They were married on June 18, 1924 and celebrated 67 years of marriage. He passed away in 1991. For 30 years they lived on and farmed the King family farm in Bloomington Township, Butler County. In 1960 they moved to El Dorado where they retired to the Carriage House in 1974. She taught in Kansas schools for 16 years, Lone Star School for four years, Bloomington Elementary for four years, and Grandview Elementary in El Dorado for eight years as a first grade teacher. Dorothea’s family fondly remembers her as the matriarch of the extended family, a woman of exemplary character, and a great saint of the Church. he was a wonderful role model for her children; grandchildren and greatgrandchildren. Her prayers and wise counsel upheld and supported her family throughout her long life. She was a faithful member of the El Dorado First Baptist Church, where her father Dr. Sharp, served as a minister during her childhood. for over 20 years. She was a member of Alpha Delta Kappa Teachers Sorority and the EMB Federated Club of Kansas. She is survived by four sons and five daughters-in-law: Edward and Ruth Ann King of Madison, Ala., Charles and Mary King of Fort Smith, Ark., Ruth King, wife of the late Kenneth King of Leon, Keith and Joan King of Carson City, Nev., Donald and Joanne King of Richardson, Texas. She has 18 surviving grandchildren and 26 great-grandchildren. She was preceded in death by her husband, Lloyd; son, Kenneth; grandson, Brian. Memorials in her memory may be made to: First Baptist Church of El Dorado; Pioneer Bible Translators, c/o Central Christian Church, 400 Waldron Road, Fort Smith, AR, 72901; Susan G. Komen Breast Cancer Foundation, Mid-Kansas Chapter, 1148 S. Hillside, Wichita, KS 67211, or left at Carlson Funeral Home, who has charge of the arrangements. Aubrey E. Martin, 88, Augusta, died Wednesday, April 14,2004. His funeral service will be held at 1:30 p.m. on Saturday, April 17, at the Augusta First Baptist Church. Visitation from 10 a.m. to 8 p.m., with family to greet friends from 6 to 8 p.m. on Friday, April 16, at Headley Funeral Chapel in Augusta. Mr. Martin was born in Douglass on Jan. 19, 1916 the son of the late Stephan Mannon and Lucinda Caroline (Bowers) Martin. Aubrey retired as manager from Martin Brothers Motors Company, where he worked for 47 years. 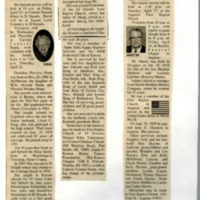 He was a member of the First Baptist Church in Augusta and served in the United States Army in World War II. On Sept. 20, 1939 he married June C. Murdick in Augusta. She survives. Other survivors include: daughter, Judy and her husband Ron Haynes of Andover; grandchildren and spouses, Brandon and Lisa Haynes, Erin and Kelly Middleton, Lindsay and Chuck Martin, Courtlee and Kelly Haynes; great-grandchildren, Lezlee, Logan, Mackenzie, Tristan, Greyson and Torren Haynes, Drake and Drew Middleton, Lander and Caden Martin. Memorials may be made to First Baptist Church, 1501 State St., Augusta, 67010. Arrangements are under the direction of Headley Funeral Chapel of Augusta.